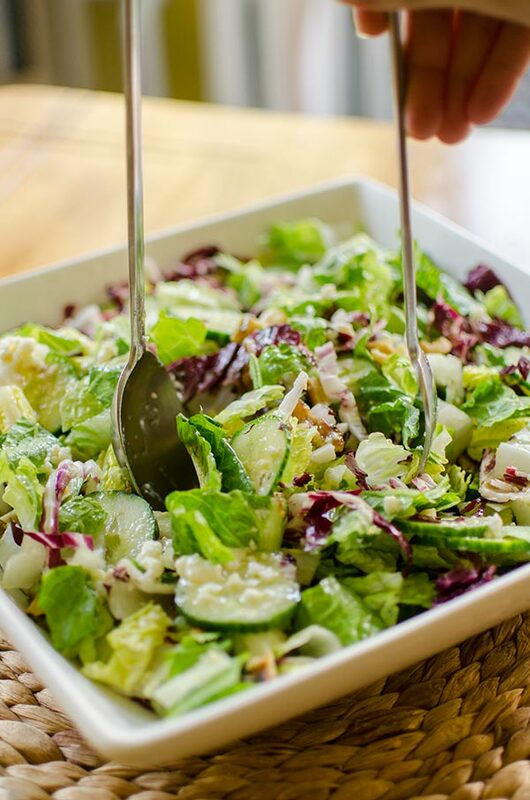 Chopped salad with romaine lettuce, radicchio, cucumber, walnuts and a simple blue cheese vinaigrette. I find that I feel better throughout the afternoon if I eat a salad for lunch. As the weather warms up I’ve been trying to include more of these delicious salads into my weekday lunch routine and have been doing quite well! We have a couple great takeout salad options close to my work, but spending $15 a day on a salad can be pretty expensive so I always try to make my own. Seeing as though I’m the kind of person who can get bored of a simple salad quickly, I’m always looking to elevate salads with special and unique dressings and ingredients– and cheese is a part of this. If you’ve been reading my blog for some time, you’ll know that homemade salad dressings are my jam. Honestly, I just love to have complete control over the flavour of my salads. Usually my salad inspiration starts with a specific ingredient. Maybe there was beautiful local asparagus available, or I have a head of kale I need to use up, but that one ingredient is my jumping off point. For this salad, the inspiration came from a soft, blue cheese called Dragon’s Breath that was chosen as the Cheese of the Month by Dairy Farmers of Canada. 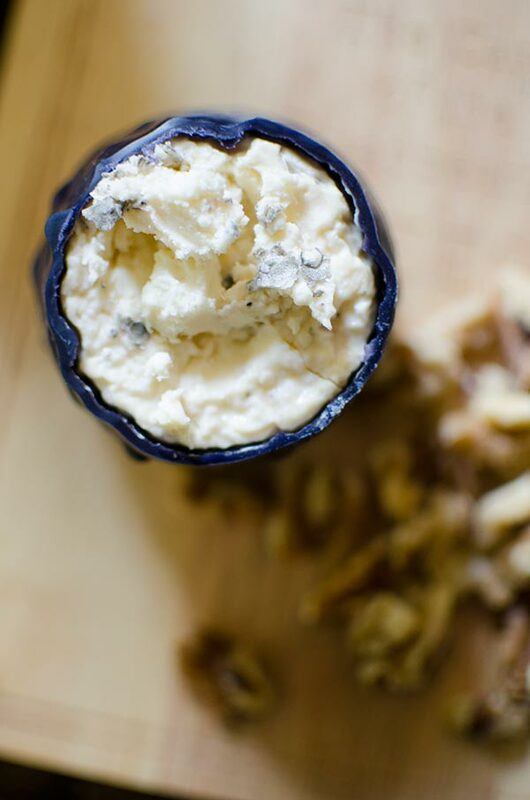 This is a creamy blue cheese, the kind you can eat with a spoon–it’s quite a delicate, slightly milky cheese with a little bite that you’ll recognize if you’re a blue cheese lover. It comes encased in a black wax coating and all you have to do is slice off the top to reveal the cheese on the inside. It can be added to a cheese plate or used in a blue cheese vinaigrette like I’ve done here. Because of the lighter, less pungent flavour of the blue cheese, I really wanted to highlight it with a simple dressing of just white wine vinegar, salt, sugar and olive oil (no mayonnaise or sour cream here). With these simple flavours, you really get a taste of the blue cheese with every bite of salad. This is a simple salad with just four ingredients; romaine lettuce, cucumber, radicchio and walnuts. Totally doable for a weekday lunch if you ask me! If you’re looking to try this particular variety of cheese, it comes from Nova Scotia, and you can actually order this exact blue cheese online (highly recommended). 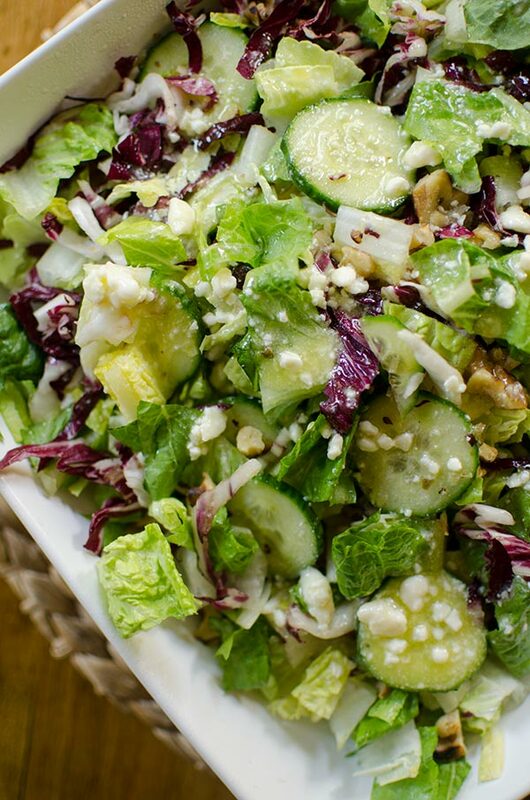 In a large bowl, toss lettuce with radicchio, cucumber and toasted walnuts. In a small bowl, whisk white wine vinegar with sugar and salt. Slowly drizzle in olive oil while whisking to emulsify. Stir in crumbled blue cheese and pour over salad. Toss before serving. 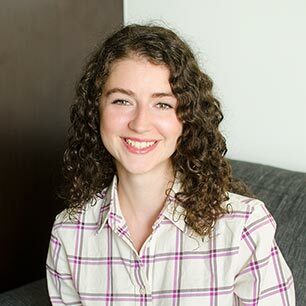 Disclosure: This post was sponsored by Dairy Farmers of Canada – as always, all opinions are my own. Thank you for supporting my sponsors and allowing me to continue creating recipes like this chopped salad with blue cheese vinaigrette!